Amazon Elastic Compute Cloud (Amazon EC2) is a cloud service that provides resizable compute capacity in the cloud. It is designed for developers to scale and monitor their web-application better way. Amazon EC2 provides some of advanced features like elastic IPs, Load Balancing, various platforms like (linux, windows, etc. ), scaling, monitoring etc. It is also easy for developers to manage their web-application in better way. Hosting WordPress on AWS is smart choice because as compare to other VPS provider amazon have low pricing, more features and other related amazing services. Also they charge you per hours your instance run. So, in this tutorial I’ll show you how you can setup LAMP environment on Linux platform and install WordPress blog manually on Amazon EC2 instance. This step-by-step guide will help you to manage your host completely which is different than cPanel. First of all you need to create your AWS account. You can sign up by following this link. You will have to provide a credit card or international Debit card and a phone number on which you will be called as part of the online registration verification process as par their terms and policy. Your credit card or debit card will be charge of minor value and it will be refunded once they verify it. Amazon offers a Free Usage Tier on which we will install WordPress, which is great to explore the services and even host real apps without being charged of single penny. After registration you have many options available and then you probably have this question in your mind that Which type of instance should I choose? 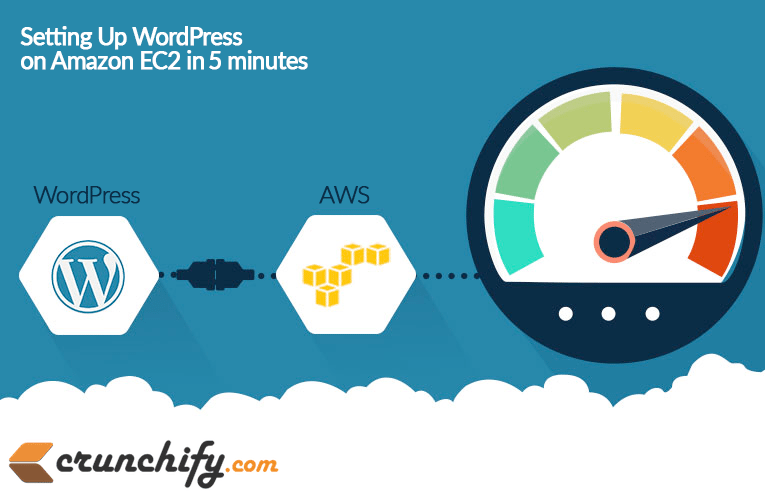 If you have new blog then you can choose EC2 micro instance which can handle around 200+ real-time traffic. It has also attractive price structure but if you are migrating your existing blog and having traffic more than thousand per day then you must choose Small instance which can handle that traffic very easily. I chose the Basic 32-bit Amazon Linux AMI. Select the Instance Type you want to use. I chose Small (m1.small). Create a new key pair. Enter a name for your key pair (i.e. crunchify) and download your key pair (i.e. crunchify.pem). Once your instance setup is complete and it shows instance is running, you can ssh into it. Select the instance in the AWS Management Console. Look for the Public DNS in the instance description (bottom part of the screen). If you are on windows system then you should use Putty for connect as SSH. You can connect with putty by following this article. In this tutorial you need to perform many shell commands and most of command require root access. So, to avoid this we will prefix these all command with sudo by switching user once for all by this command. (Use your actual public DNS name). You should see a standard Amazon place holder default page. This will uncompress WordPress in its own WordPress directory. [ec2-user ~]$ mv *. * ..
http://ec2-50-17-15-27.compute-1.amazonaws.com/blog (Use your public DNS name). This should open the WordPress installation configuration process. Open the httpd.conf file with your favorite text editor (such as nano or vim). If you do not have a favorite text editor, nano is much easier for beginners to use. Find the section that starts with <Directory “/var/www/html“>. To map your domain name to your IP address, you will have to use the tools provided by your domain registrar. If you use GoDaddy, specify NS73.DOMAINCONTROL.COM and NS74.DOMAINCONTROL.COM as the name servers for your domain, and use the DNS Manager to modify the A record and point to your IP address. Note the old site URL and the new site URL for your instance. The old site URL is likely the public DNS name for your EC2 instance when you installed WordPress. The new site URL is the current public DNS name for your EC2 instance. If you are not sure of your old site URL, you can use curl to find it with the following command. In a web browser, enter the new site URL of your WordPress blog to verify that the site is working properly again. You have successfully created LAMP environment and installed WordPress on Amazon EC2. If you get any type of error or got stuck in some of task please let us know by commenting here. We will try our best to provide solution for your problem.